During Nickelodeon’s 11th annual Worldwide Day of Play on Saturday, September 20, the network’s TV channels, websites, and apps will go off the air and offline to inspire kids to be active. Partners for this year's Day of Play include—NFL PLAY 60, the Boys and Girls Club of America, Key Club, Girl Scouts, Playworks, NFL Play 60 and Girls on the Run to name a few. These and other organizations will host thousands of events around the country to encourage the love of play. 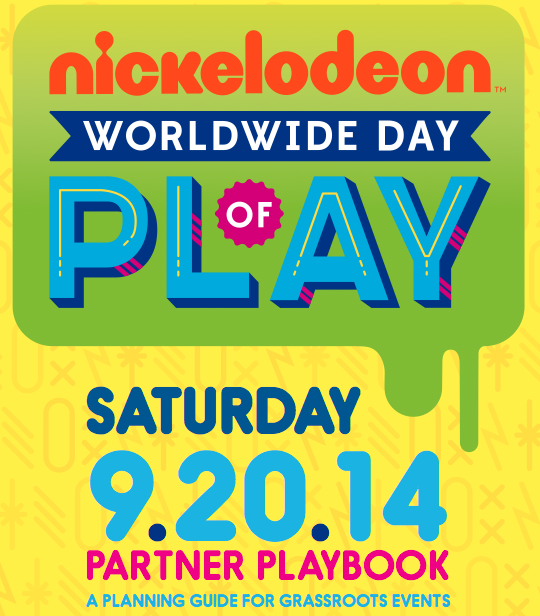 The Nickelodeon World Wide Day of Play will take place Sat. September 20, 2014. A planning guide called a Partner Playbook is available and free for download. For more information download the playday toolkit or got to the Nickelodeon website. Posted by Peaceful Playgrounds, Inc.